If you pull the sunroof control lever backward, both the sunshade and sunroof glass will slide all the way open. 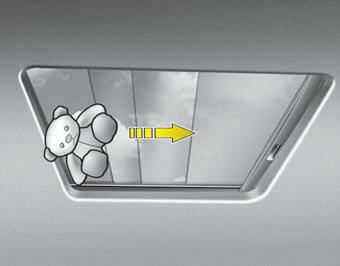 To stop the sunroof movement at any point, pull or push the sunroof control glass lever momentarily. If you pull the sunroof glass control lever backward, the sunroof glass will slide all the way open. 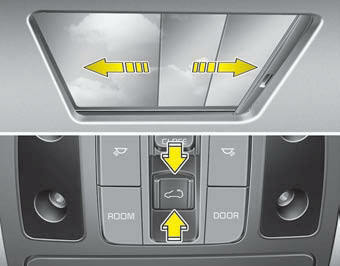 To stop the sunroof glass movement at any point, pull or push the sunroof control lever momentarily. To close the sunroof glass pull (or push) the sunroof glass control lever downward (or forward). When you push the sunroof glass control lever forward or pull it downward, the sunshade will be closed halfway and glass will be closed at the same time. And then sunshade will be fully closed finally. When you push the sunroof glass control lever forward or pull it downward while the sunshade opened, the glass will be closed.